Who doesn’t want to achieve faster “time-to-information” and shorter “time-to-decision” for executives and managers with mobile BI? Who doesn’t want to disseminate insights or KPIs to front-line employees, such as field sales representatives, line of business managers, and field service employees? 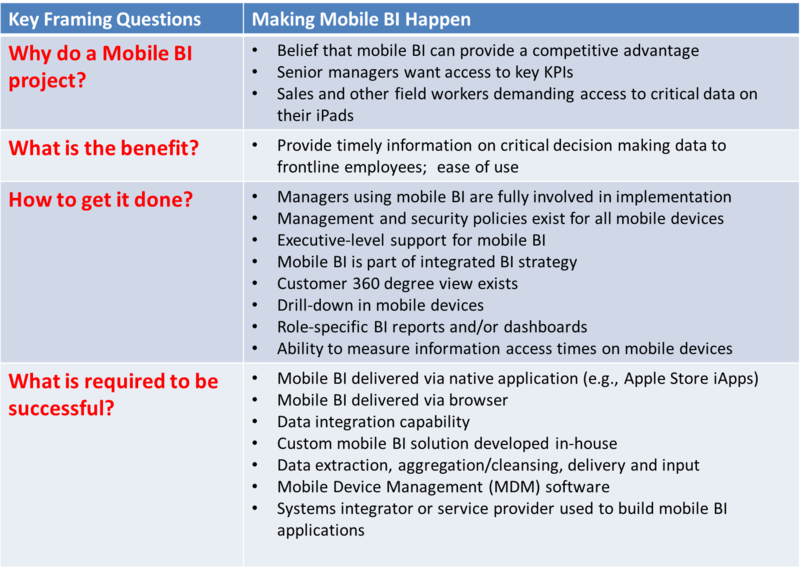 The question is not whether Mobile BI is a good idea but how to execute this program in a low-cost way? How to design and deploy eye-popping “wow” apps? 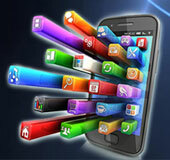 How to support, maintain and enhance these apps which are constantly changing? What technology and infrastructure to put in for a national or global deployment? Who is going to fund all this plumbing – corporate, LoB or IT? Business Analytics solutions for “always-on” 3/4G enabled mobile devices – iPads, iPhones, tablets, smart phones – are becoming prevalent as the form factor becomes appropriate for BI. We are increasingly seeing firms build state-of-the-art dashboard solutions for iPads. The “post-desktop” apps provide senior management with intuitive interactive access to the company’s most important business KPIs and dealing with data overload. Tablets, 4G Wireless and next gen displays (+gesture based, verbal interfaces) have enabled new productivity improvements and better ways to consume information, perform ad-hoc querying and scenario planning. Dashboard, heatmaps and scorecards on the iPad, iPhones and Androids are intuitive, attractive, powerful, available at any time and any place: a perfect mix for top managers, sales teams and even customers. BI (and Information Management) is a natural fit for mobile devices. Managers, blue and white workers spend a majority of their time away from their desks. Most are traveling, walking about or driving from site to site. And it’s these mobile workers who need the most up-to-date information. They need mobile BI to retrieve data to make on-the-spot decisions, monitor operational processes and review KPI, and work-in-process dashboards. 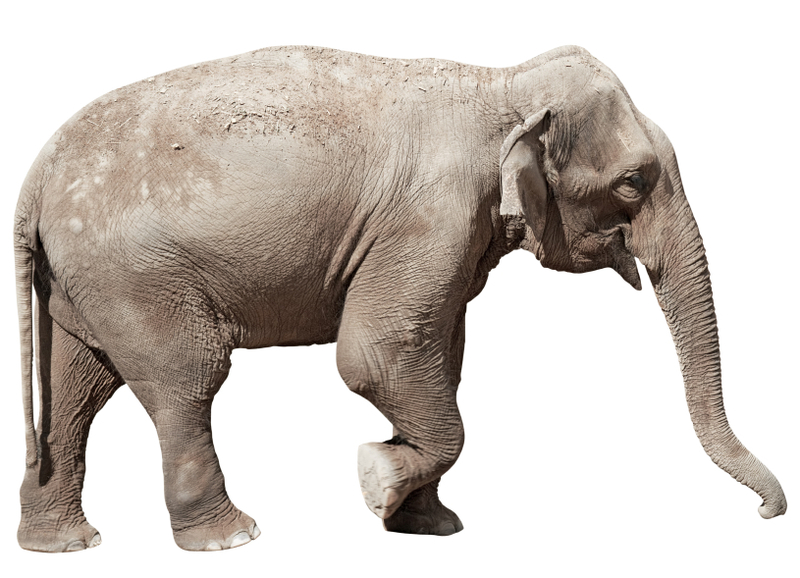 In the ancient Indian parable of the elephant, six blind men touch an elephant and report six very different views of the same animal. Compare this scenario to a data warehouse that is getting data from six different sources. “Harry Potter and the Sorcerer’s Stone” as a field in a database can be written as “HP and the Sorcerer’s Stone” or as “Harry Potter I” or simply – “Sorcerer’s Stone”. In the data warehouse these are four separate movie titles. For a Harry Potter fan, they are the same movie. Now increase the number of movies to cover the entire Harry Potter series and further include fifty languages. You now have a set of titles which may perplex even a real Harry Potter aficionado. What does this have to do with data analytics? The “Raw Data -> Aggregated Data -> Intelligence -> Insights -> Decisions” is a differentiating causal chain in business today. To service this “data->decision” chain a very large industry is emerging. The Business Intelligence, Performance Management and Data Analytics is a large confusing software category with multiple sub-categories — mega-vendors (full stack, niche vendors, data discovery, visualization, data appliances, Open Source, Cloud – SaaS, Data Integration, Data Quality, Mobile BI, Services and Custom Analytics). But the interest in BI and analytics is surging. Arnab Gupta, CEO of Opera states why analytics are taking center stage, “We live in a world where computers, not people, are in the driver’s seat. In banking, virtually 100% of the credit decisions are made by machines. In marketing, advanced algorithms determine messages, sales channels, and products for each consumer. Online, more and more volume is spurred by sophisticated recommender engines. At Amazon.com, 40% of business comes from its “other people like you bought…” program.” (Businessweek, September 29, 2009). The term “business intelligence” (BI) dates back to 1958, when IBM researcher Hans Peter Luhn coined the term in an IBM Journal article. However, it took until 1980s when decision support systems (DSS) became popular and mid 1990s for BI started to emerge as an umbrella term to cover software-enabled innovations in performance management, planning, reporting, querying, analytics, online analytical processing, integration with operational systems, predictive analytics and related areas. 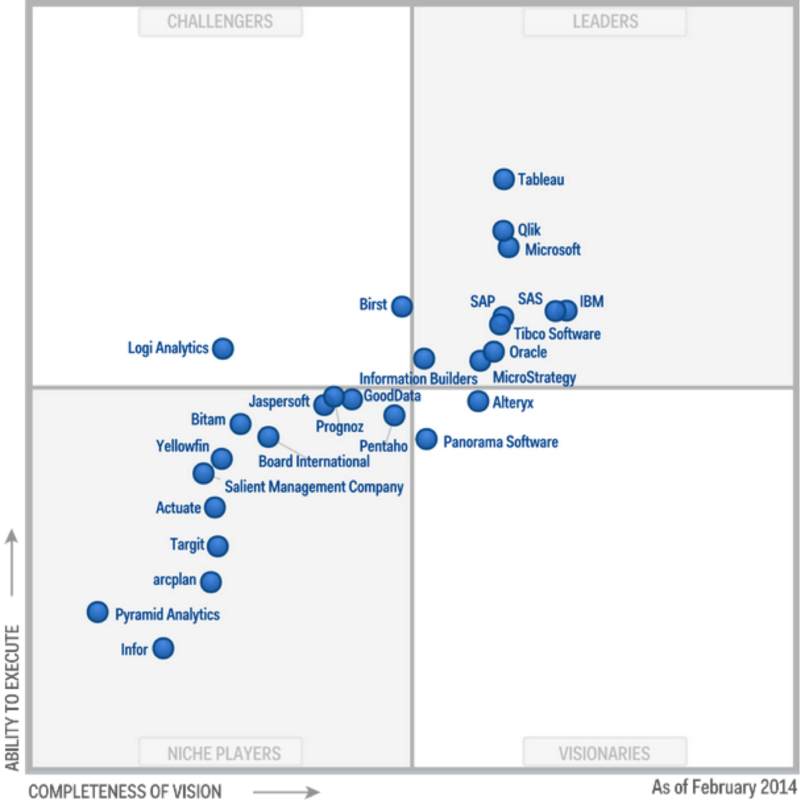 Gartner 2014 magic quadrant shows the key players in the BI market. The different players are differentiated based on five abilities— ability to handle large volumes of data, ability to deal with data velocity, variety (structured and unstructured), visualization capabilities and domain/vertical specific accelerators. Analytics is becoming three different markets. First of all, there is the BI market which is actually going through quite a bit of change itself. This is a more consolidated market than we have seen in the past and there is a tremendous amount of work being done by Oracle, SAP, IBM and others to kind of retool it for the next generation of BI. So it is a growing market, lots of upgrade, replatform, modernization demand, lots of clients who are finally realizing that the tools (visualization etc.) are ready to give them some of the capability that they have historically cared about. The second part of the market is what is called Advanced Analytics. Here you need PhD level data scientists who have backgrounds in machine learning, industry specific domain modeling, and different types of data science who can apply that in a very specific way to specific industry problems. This is a rapidly growing part of IT Services. Also, there are just not enough data scientists to go around. The third part of the market is Analytics as a Service. This is about leveraging software-as-a-service platforms as opposed to on-premise. This is about a business model that is more like Business Process Outsourcing (BPO). Clients buy business outcomes; they don’t buy transactions and FTEs. The analytics market has thousands of boutique consultants who are specialists in particular industries or specific technologies. It includes all the major technology providers, who are all trying to advance their business and capabilities that they are bringing to the market. And then there are vendors who are just bringing sheer capacity of data science skills to the market and they are coming in from a completely different angle of basically just renting the expertise of their data scientists into the market. The market is incredibly fragmented. We are in the early stages of growth in the market. Every single one of our clients is building this capability internally and they are looking for more services from vendors, because the opportunity to apply analytics is in every single one function whether it is a customer analytics, industrial Internet, e-commerce platform, is growing. Analytics is embedded into literally every single business interaction. More recently to support a new generation of cost cutting and growth initiatives, corporations are investing heavily to gain near real-time actionable insights (historical and predictive), and from a mix of disparate spreadsheets and myriad of systems (legacy, internal silos, customer facing, suppliers, partners, etc.). SAP AG recently released a new 4.0 version of its BI (business intelligence) and EIM (enterprise information management) solutions. They also released Enterprise Performance Management (EPM 10). We think this will be a big deal for current customers who are struggling to build a robust enterprise foundation for BI for the diverse business initiatives. Having multiple BI projects with each on a slightly different data hubs leads to chaos and insights where people are unsure about what the numbers mean as they could be interpreted differently along the information chain. We expect a significant upgrade cycle looming for the SAP community. BusinessObjects 4.0 is a major release after the merger of SAP and BusinessObjects in 2007 and SAP and Sybase in 2010. It incorporates a significant capability enhancement that business users and CIOs are demanding around analytics – more real-time, better in-memory computing; BI for the masses – powerful BI in users hands, mobile BI capabilities across a wide spectrum of devices; combining structured and unstructured information and providing the tools to govern the information and finally dealing with the growing avalanche of social media data. Also a common “look and feel” and better data visualization provides a better overall User Experience. Big Data Fatigue and Company Shakeout? What is Business Analytics? Business Analytics is the intersection of business and technology, offering new opportunities for a competitive advantage. Business analytics unlocks the predictive potential of data analysis to improve financial performance, strategic management, and operational efficiency. Analytics is “the extensive use of data, statistical and quantitative analysis, explanatory and predictive models, and fact-based management to drive decisions and actions.” Data analytics software and advanced analytics techniques, include predictive analytics, text analytics and text mining, customer analytics and data mining. What is BI? BI is the "computer-based techniques used in spotting, digging-out, and analyzing 'hard' business data, such as sales revenue by products or departments or associated costs and incomes. Objectives of BI implementations include (1) understanding of a firm's internal and external strengths and weaknesses, (2) understanding of the relationship between different data for better decision making, (3) detection of opportunities for innovation, and (4) cost reduction and optimal deployment of resources." (Business Dictionary). Most widely used BI tool is Microsoft Excel. Corporate performance management software and performance management concepts, such as the balanced scorecard, enable organizations to measure business results and track their progress against business goals in order to improve financial performance. Data visualization tools, include mashups, executive dashboards, performance scorecards and other data visualization technology, is becoming a major category. BI platforms provide a range of capabilities for building analytical applications. Examples are Oracle OBIEE, SAP Business Objects 4.0. There are many choices and combinations of BI platforms, capabilities and use cases as well as many emerging BI technologies such as in memory analytics, interactive visualization and BI integrated search. The idea of standardizing on one supplier for all of one’s BI capabilities is difficult to do. Increasingly, standardization and more about managing a portfolio of tools used for a set of capabilities and use cases. Data integration tools and architectures in support of BI continue to evolve. Extract-Transfer-Load (ETL) tools make up a big segment of this category in addition to data mapping tools. Organizations must now support a range of delivery styles, latencies, and formats. BI is about "sense and respond." 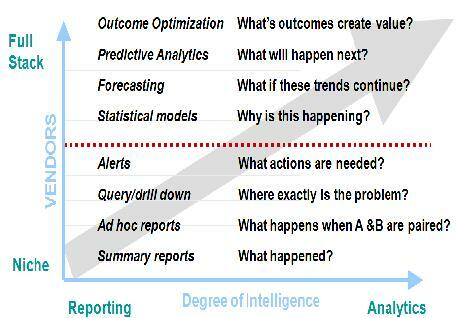 Analytics is about "anticipate and shape" models. Business Analytics 3.0 blog is meant for decision makers and managers who are trying to make sense of the rapidly changing technology landscape and build next generation solutions. It is aimed at helping business decision makers navigate the "Raw Data -> Aggregate Data -> Intelligence -> Insight -> Decisions" chain.